With the new Sonoro CD 2, you will experience the perfectly thought-out music system for your bedroom. The design emerged from the intensive analysis of the sleep of many subjects, as well as in close collaboration with relaxation experts, taking scientific knowledge into account. Inspired by nature and the daily challenges of our society. 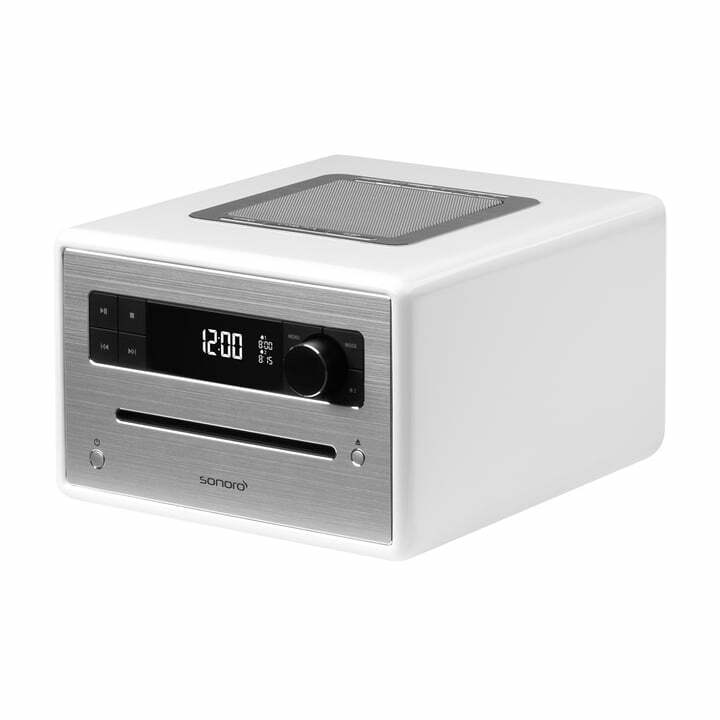 Together with slowtime Sonoro has created unique contents for the reduction of stress and to design the "perfect" music system for the bedroom. CD2 puts you gently to sleep with sounds of a CD, radio or preloaded relaxation and meditation content. And the dimmable display automatically adjusts to the light in the room. In the morning the music system wakes you up with selected favourite music from the digital radio or from the CD – for a perfect start in the day. With the built-in nature sounds SonoroCD brings natural sounds and relaxing noises into your bedroom: the sound of the sea, open fire or birds chirping - CD2 keeps different sounds ready to wake you up. When connected with the dimmer module sonoroLIGHT (not included), SonoroCD 2 wakes you up with a sunrise simulation, which contributes to regulate naturally the sleep / awake phases. The result: Getting up gets easier. The reason: Light supports waking up, because the "wake up hormone" cortisol is released and the "night hormone" melatonin is suppressed in the body. An additional feature is the gradual sunset, which helps to relax at the end of the day and go to sleep. In conjunction with meditation and relaxation content, the sonoroCD2 can help, not only to improve the mood, energy, productivity, but also the sleep and wake-up quality. More colours are available on request as well as the additional dimmer module sonoroLIGHT. Aux-In for more external playing sources such as smartphone, laptop, etc. Amount of batteries (remote control) 1 pcs.